If The Blind Assassin was a layer cake, the layers would be the impossibility of true love, the inexorable destructive force of time, and chocolate. The frosting is pulp and newspaper. It's a remarkable novel, if only for the way Margaret Atwood weaves together three wildly different genres into a whole. There's the gentle comedy of old age about an old woman living a rather solitary existence in a small Southern Ontario town. There are her reminiscences of her life and family, an old-fashioned bildungsroman or family saga. Then there's a story about a doomed romance and pulp science fiction. Each on their own a very good book, but together form a great one. 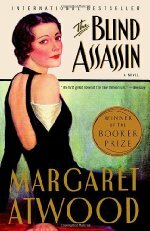 While The Blind Assassin is widely considered a modern classic today, it wasn't altogether favorably received when it was published. Yes, many reviews praised it to the skies, and it did win the Booker Prize, but Thomas Mallon absolutely panned it in The New York Times, and Adam Mars-Jones rated it middling at best in The Guardian. The latter paper has gone on to champion the book. In 2003, John Mullan wrote four separate pieces on the novel, focusing in turn on recollection, omission, novels within novels, and newspaper articles. Ten years later, Mullan wrote an article about the book's form for the newspaper's book club, and interviewed Atwood on stage, which The Guardian released as a podcast. The Guardian also got Atwood to write about the book herself. Personally, I loved The Blind Assassin when I read it. It's one of those books I completely disappeared into while reading. Part of the joy is the sheer mass of it. The reader is in the world, getting to know the characters, for such a long time. And while there remain plenty of mysteries, it's rare that a reader is given so much information about the people within. The Chase sisters are presented in every type of situation. Various other characters who'd be incidental figures in shorter works are given entire life stories. The world it creates, or rather the worlds it creates, completely enveloped me. Port Ticonderoga feels like a place I visited, and the same goes for Sakiel-Norn and the Toronto of the 1930s and 40s. I have never been to Ontario, but through this novel and stories by Alice Munro, I feel like I've been there. I'm always fascinated by books who can create such a strong sense of place, whether it's The Lord of the Rings, Anna Karenina or Tale of Genji. It was a book that played my emotions like an old piano. I've rarely despised characters as strongly as Richard and Winifred. I felt the Chase sister's anguish with full force. I laughed quite a few times at Iris's wry observations about old age. I could go on listing things like that. Heck, I even felt sad for the decline of Port Ticonderoga. Last but not least, The Blind Assassin is full of ideas, worked out through fiction. It's a feminist examination of what it was to be a Canadian woman in the 20th Century. It's a commentary on the relationship between Communism and pulp science fiction. And it's survey of Southern Ontario society, from the exclusive clubs of the interwar period to the inside of a pick-up truck on the highway in the 90s. I didn't want to put spoilers in the main post, but anything's fair game in the comments. If you haven't read The Blind Assassin, I urge you to get it. It's worth the read, and worth discussing. For those who've already read it, what's your take on it? I read it so long ago that I barely remember any of it except the vague outline of the plot. I loved it at the time I read it and since then it's been one of the books that leave me completely skeptical when anyone says they didn't enjoy it.